Let us analize and upgrade your network to increase speed and performance using the actual technologies on wired Ethernet and/or Wireless networks for your home, home office or small business. From the last decade many computers were sold with gigabit Ethernet capability and backward compatibility with Fast Ethernet and Ethernet. Gigabit Ethernet can increase data transmission rates up to 1000 Mbps often using the existing cabling or in the worst case rewiring the premise. Gigabit ethernet is 10 times faster than Fast Ethernet(100 Mbps) and 100 times faster than regular Ethernet(10 Mbps). To ensure that the maximum speed of a Wired Gigabit connection is achieved, you will need a compatible Gigabit Network port (RJ45) on your connected device, such as a PC, Laptop, Server, NAS device or Gaming console. Devices that do not have a Gigabit port will still connect, however, this will be at Fast Ethernet speeds up to 100Mbps. 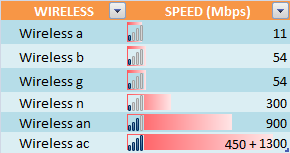 How fast is your current wireless router or wireless adapter? If currently your router is based on wireless 802.11agn with three spatial data streams, the maximum theoretical speed is up to 450Mbps. You can claim that your existing router is the fastest router based on the 802.11an N900 technology; you can say Netgear WNDR4500 N900 router or Linksys EA4500 N900 Cloud router or other N900 router. Soon your router would be out dated with the introductions of new 5th generation of Wi-Fi network 802.11ac standard. This wireless ac standard delivers the gigabit speed up to 1300Mbps exceeding your gigabit wired cable connectivity (theoretically). Currently Netgear introduces R6300 wireless ac router, and Buffalo WZR-D1800H wireless ac router which both of them are dual band gigabit wireless ac router with the blazing speeds up to 1300Mbps.